just some guy squatting in front of Marie Laveau's House of Voodoo. not sure why he chose this place to read. How nice of this fellow to sit himself down at just the right spot amongst all those lines and geometric shapes! Nice processing, too. Cool shot. Looks like Moby. Absolutely, fantastic, I could talk about all the focus, contrast and other stuff, but it all comes down to the story, this picture has a story someone can sink their teeth into. Should have saved for free study, I know I would have voted a unquestionable 10. Add to favorite. Elvis, this is paramount my man! The composition is spot on, the contrast is great and all that other photographic wallop... but what you've done is given an insight into this man's day, ABSOLUTELY SPECTACULAR! Fav and now I'm off to look at the rest of this collection. I like this. He looks fairly young. The building looks fairly old. The cig butts give a sense of time spent by the guy at this place. It could be a poster for a library or for adult education. The only thing that I could suggest to make it better is a more rough texture to reflect the mood of the picture. Life is hard but you can lose yourself in a book. 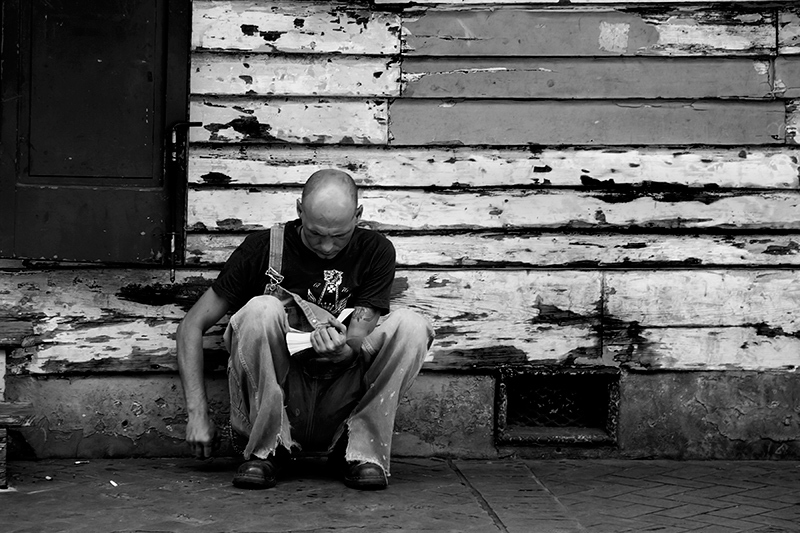 Nice shot, that book looks about as big as my PS book..
Great candid street photograghy. Love the textures and tones. The subject makes the shot. Proudly hosted by Sargasso Networks. Current Server Time: 04/20/2019 08:40:01 PM EDT.